According to the November Spectrem Millionaire Confidence Index (SMICI®), more investors with $1 million in investable assets are choosing to stand pat with investments rather than increase their exposure. Millionaires recorded drops in every investment category in the Index with the exception of Real Estate, and there was an increase in Millionaires who are not increasing their investments at all in December. On the other hand, the November Spectrem Affluent Investors Confidence Index (SAICI®) among those investors with $500,000 or more of investable assets recorded a slight increase stock and stock mutual fund investing and a few more investors getting back into the investment mood. Among all investors, the only category to see an increase in interest was Real Estate, jumping from 4.4 percent of investors to 9.6 percent. The largest drop in interest was in Cash investing, from 26.4 percent to 19. 2 percent of investors. Millionaires recorded a significant drop in interest in Stock Mutual Fund investing, from 45.7 percent to 38.5 percent. There were smaller decreases in Stock, Individual Bond and Bond Mutual Fund investing, and a slight increase in Millionaires not investing further In December. Among Non-Millionaires, there was a slight increase in Stock, Stock Mutual Fund, and Real Estate investing, while there were decreases in Individual Bond, Cash and Bond Mutual Fund investing. There was a slight increase in investing interest, with only 44.4 percent choosing not to invest further in December. 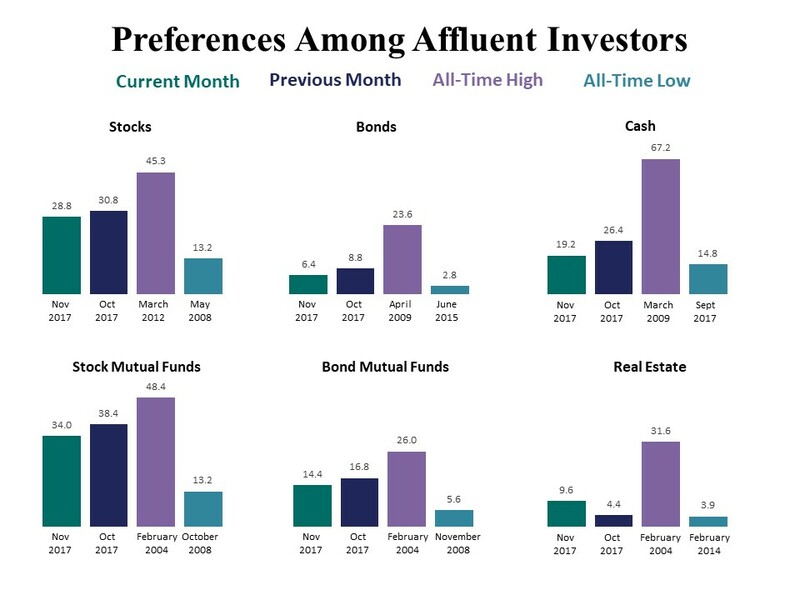 From a historic standpoint, all investment intentions are in a normal range with the exception of Millionaire Real Estate, which at 12.6 percent is its highest mark since July of 2014. The Millionaire Confidence Index between men and women is as close as it has ever been. Men recorded a Confidence Index of 12 while women had a Confidence Index of 9. Two months ago, the difference was 23-8 in favor of the men. Women are historically less confident than men but the difference is often in double digits. Women overall show a greater interest in increased stock investing at 31.8 percent to 27 percent among men. They also have a greater interest in Individual Bond and Real Estate investing, and that rarely happens in the Spectrem Confidence Index. Among Non-Millionaires, the male Confidence Index was at 11 in November and at 2 for women. Historically, this is also a smaller-than-usual difference in confidence between men and women. Republicans indicated a higher level of involvement than in the previous month, with only 24.27 percent not investing further in December. Of those planning to invest, the highest interest among Republicans was in stock investing, with 33 percent planning to invest. Democrats were more likely than Republicans to invest in Bonds and the Bond Mutual Fund market. More retired investors are going to sit out the month of December, as they record less interest in investing in everything but Real Estate. Meanwhile, among working investors, there is an increased interest in Stock, Individual Bond, Bond Mutual Fund and Real Estate investing. For retired investors, the Confidence Index went negative for both Millionaires and the overall segment. For retired Millionaires, the index went negative for the first time in 2017. Working investors also recorded drops in confidence among Millionaires and the overall segment.